The word prompt for the 10th Edition of Smile For The Camera is Costume? No, not as in Halloween. Costume as in dress in general; especially the distinctive style of dress of a people, class, or period. Show us that picture that you found with your family collection or purchased that shows the costumes of the rich to the not so rich, from the civil war to the psychedelic sixties. 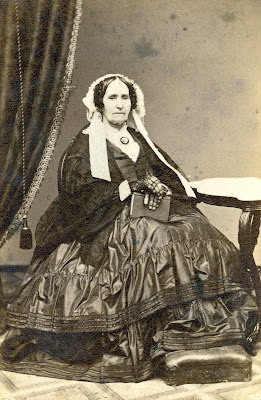 You can't get much more typical Civil War era than this older woman in fashionable gown. Her bonnet is a bit old-fashioned but that was very common with older women. They often stuck to a hair style or bonnet they had worn in their younger years. What a wonderful picture; she looks so intimidating! What exquisite detail in her dress. And it looks like she is wearing (partial?) gloves? Wonderful image. Her lacy gloves or mitts might be from earlier too. Interesting as she is so well dressed but her fingers do look as if she has had to work hard in her life, don't you think? Hi everyone - it's a great photo, I wish I knew who the lady was. Everything about her is an older woman having her photo taken in the early 1860s but wearing fashion from the 1850s! The full sleeves tapering in at the wrist, the layered full bell shaped skirt, the drop shoulders, her hair in short curls covering her ears. The lacy gloves are the fancy gloves that covered only part of her fingers which are indeed rough looking. I suspect this was her one and only good outfit, perhaps one she wore to something special 10 or 15 years before this photo was taken. A wonderful photo, thank you Lorine, showing so many characteristic aspects of costume from that era. As you say, it's common in old photos that an older woman is wearing clothes that are perhaps not quite the latest fashion. The photograph appears to be a typical carte de visite from the early to mid-1860s. If I am correct in the cdv assumption, then it certainly won't be from before 1860. It's a quality portrait, not just a quality subject, and you may well be able to narrow down the time frame by investigating the photographer, the style of card mount, etc. For example, does the card mount have a revenue stamp affixed to the reverse? If so, then you may be able to narrow it down to a particular year! DNA Genealogy - Friend or Foe? Baa baa blacksheep, have you any cows?